Bridgetown, Barbados (28 Dec 2017) – This has been a challenging year for Caribbean tourism. While the first half of the year saw exciting growth in both tourism infrastructure and tourist arrivals over the previous year, in September we were hit hard by a series of unusual hurricanes that not only destroyed property, but also took the lives of many of our citizens. We must never forget the souls we lost along the way. Physically, we will recover. Our Caribbean people are a resilient population. We will put the bricks and mortar back together and the hotels and vegetation will rise again and shine in the brilliant sunlight. We take this time, a season of celebration and joy and the promise of a new beginning, to both reflect on the preceding year and look forward to tomorrow. And we will take the time to give thanks. Travellers coming to the countries that were impacted by the storms will now see various stages of the rebuild/recover effort. Some are already fully up to speed and ready for the winter; others, only partially so. Our affected islands respect the safety and security of guests and staff and are therefore being frank and open about their state of readiness. As tourism is the main economic driver for most of the Caribbean, we place enormous emphasis on delivering value and a superb visitor experience. In the hurricane-affected islands guests in 2018 and beyond will expect to see a product that is rebuilt stronger, better and even more attractive than before. That’s the plan, however long it takes to deliver. We are thankful that the vast majority of the Caribbean never got touched by the hurricanes, so those islands have continued to welcome visitors every day. For them it’s business as usual. We are grateful to the travel professionals, the many visitors and our citizens themselves who continue to share images of the Caribbean today. Those pictures tell a thousand realities. We want to use this time to thank our member countries that were quick to come to the aid of others not so fortunate. We want to thank our partners, the Caribbean Hotel & Tourism Association, the airlines, cruise lines and the hotels across the region that have worked and are still working to bring the Caribbean back to normal operations. We want to thank our marketing and sales partners, the tour operators, wholesalers and travel agents from around the world who have stood by the region and continue to promote and sell our destinations. And we want to thank the media that have, for the most part, painted a proper picture of our region that is clearly open for business. Through it all, we are also eternally grateful to our visitors and to the Caribbean Diaspora who stand shoulder to shoulder with our region in times of need. Even as we prepare to greet a New Year let us take a moment to look back on a few of the successes of 2017. Recently we embarked on a strategy to substantially enhance the Caribbean’s engagement in Canada, to develop business in non-traditional areas and work closely with our members’ representatives for maximum impact. New travel agent training and certification, increased use of targeted social media, enhanced deployment of the CTO’s data analysis tools, and more focused engagement with the Caribbean Diaspora were all components of the 2017 strategy for Canada. The Canadian market was a strong performer for most of 2017, with arrivals up by 6.4 percent. We can now look forward to more expansion of that market in 2018. We also continued to focus on our two primary markets, the United States and Europe, with the UK, in particular, taking a central role. These markets were more robust in 2017 and we trust this will continue in 2018. We realized too, that intra-Caribbean tourism, which has also been on the rise, would need our continuous attention, especially under the current circumstances where the task of educating the travelling public and removing the barriers to intra-Caribbean travel will continue to be a challenge. At the start of the year we declared 2017 the Year of Adventure in the Caribbean and we capitalized on this in multiple promotions with member countries and industry partners. The Caribbean Year of Adventure linked directly with the United Nations Year of Sustainable Tourism for Development and allowed us to pair adventure with sustainability. The year culminated with the World Tourism Organization holding its Global Conference on Jobs and Inclusive Growth, in Jamaica, followed by the CTO’s partnership with the Caribbean Development Bank to host the Climate Smart Sustainable Tourism Forum in St. Kitts. For the New Year the CTO has declared 2018 The Year of Rejuvenation in the Caribbean. With wellness and rejuvenation being important aspects of the Caribbean tourism product, we are encouraging our member countries and private sector partners to plan and organise events and activities around that theme. For travellers who focus on renewing body and spirit, the options are virtually endless; from beachfront workouts and yoga retreats, to wellness resorts and spa treatments, the notion of being rejuvenated in the Caribbean is one more reason to let us pamper you in 2018. The 2018 Caribbean Year of Rejuvenation will be promoted through social media and traditional media channels and will create opportunities for locals, travellers and holiday/vacation planners to share their ideas on how to capture the Caribbean’s huge capacity for wellness and rejuvenation. It will be a time of rebirth for us and for those who come to share the joy of a Caribbean vacation experience. We look forward to 2018 with optimism and excitement. On behalf of our CTO Chairman, The Hon. Dionisio D’Aguilar, Bahamas Minister of Tourism, the CTO Council of Ministers and Commissioners of Tourism, the Board of Directors, Members and Staff of the CTO, I thank you for your continued support of our region, and I wish you and yours a safe, peaceful and prosperous New Year. 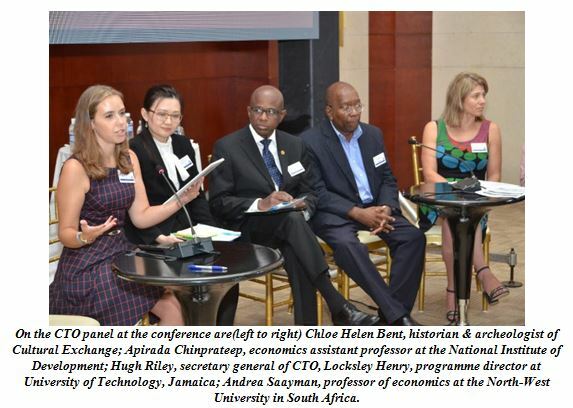 BRIDGETOWN, Barbados (18 Dec, 2017) – Hugh Riley, Secretary General of the Caribbean Tourism Organization (CTO), the region’s tourism development agency, urged building upon the resilience of tourism and supporting Caribbean tourism to prepare, manage and recover from crises, to more than 1,500 participants at the Global Conference on Jobs and Inclusive Growth: Partnerships for Sustainable Tourism, held recently in Montego Bay, Jamaica. Mr. Riley called for exploring potential strategies for the tourism sector to plan for future preparation, management and recovery, specifically after the category five hurricanes that impacted a handful of member counties. He advised participants of the scope, size and resilience of the tourism sector and of the CTO, and highlighted CTO’s focus on sustainability and the depth and breadth of the relationships CTO has created, as well as the resources the organization makes available for CTO member countries. The secretary general also urged establishing energy policies and observing protocols that improve the region’s climate resilience, effective disaster risk management and reduction, enforcing and maintaining proper building codes. “It was truly an honour to present at this conference where the goal was centered on a new, collaborative framework for tourism, moving towards the 2030 agenda for sustainable development,” he said. Addressing the topic of resilience, Mr. Riley shared the six areas of focus that the CTO considers essential to building support for Caribbean tourism: sustainable development, resource mobilization, brand leadership, research and market development, human capital development and advocacy. In closing, Mr. Riley urged the region to enlist champions among celebrities as well as public and private sector leaders. “Effective advocacy speaks powerfully to the issues that facilitate the development of travel and tourism globally,” he added. In addition to his presentation, Mr. Riley moderated the “Caribbean Tourism within the Context of the Americas” session. Organised by the World Tourism Organization (UNWTO), the Government of Jamaica, the World Bank Group and the Inter-American Development Bank, the global conference brought together world leaders from governments, the tourism industry, donors, and international development and finance organizations, to design and coordinate an international road map and foster collaborative relationships for inclusive economic and social development of tourism. An official event of the International Year of Sustainable Tourism for Development 2017, the event gathered more than 1,500 participants and over 150 speakers to help identify successful models and initiatives of public-private partnerships that will contribute to sustainable tourism development globally. In order to achieve results, the conference yielded practical plans to guide future development initiatives including specific development protocols and opportunities related to the achievement of global partnerships for sustainable development. For more information about the UNWTO Global Conference on Building Partnerships for Sustainable Tourism for Development, visit http://know.unwto.org/event/unwto-global-conference-building-partnerships-sustainable-tourism-development. TORONTO, Canada , 21 November, 2017 – The Caribbean Tourism and Hospitality Investment Guide, a bi-annual publication of the Caribbean Tourism Organization (CTO), was distributed during Caribbean Week in Toronto to Canadian entrepreneurs, business organizations and Diaspora leaders. Caribbean Week activities in Toronto and Montreal run from November 10-17. The Investment Guide showcases a wide range of investment opportunities in the tourism and hospitality sector in CTO member states and lists incentives that Caribbean Governments are offering to attract new business. The publication was distributed at the recent Caribbean Hotel Investment Conference and Operations Summit (CHICOS) in Bermuda and is available to delegates at this week’s Miami Conference on the Caribbean organized by Caribbean Central American Action (CCAA). Tourism Ministers from across the region and selected companies and business organizations received copies of the publication during Caribbean Week events in New York. The publication includes information on the performance of the region’s tourism industry with highlights from the CTO Secretary General Hugh Riley and Acting Director of Research Ryan Skeete. It also provides an outlook for the region’s hotel sector. The Investment Guide highlights new investments in the region’s tourism and hospitality sector including properties in The Bahamas, Barbados, Antigua and Barbuda, Jamaica, Saint Lucia, Grenada, Turks and Caicos Islands and the Cayman Islands. “The Caribbean has a strong competitive advantage due to our natural and physical resources, and is ripe for new hotel and tourism infrastructure projects. There are opportunities for investments in airports, seaports and shopping centres, as well as unique tourism products such as outfitting heritage sites with modern technology and clean energy sources,” CTO Secretary General Hugh Riley said. The Investment Guide is produced by Marketing, Communications and Investment Promotion Specialist, Sandra Ann Baptiste, who heads Florida-based Carigold Signature. “CTO member countries are also seeking investment to expand the medical tourism and health and wellness sectors. There are investment opportunities for new restaurants and cafes, sports tourism facilities and new convention centers, yachting and marine services, new attractions, river and land transportation services, and to develop the creative industries,” Baptiste said in the editorial. The Investment Guide is one of the projects of the New York-based CTO USA Inc. office headed by Sylma Brown Bramble. The publication will be available on www.onecaribbean.org for a minimal fee. TORONTO, ON, 14 November, 2017 – The Caribbean Tourism Organization (CTO) has declared 2018 the Year of Wellness and Rejuvenation in the Caribbean. The CTO’s secretary general Hugh Riley announced the theme for next year at a news conference here on Monday 13 November, as part of the programme for Caribbean Week Canada 2017. With wellness and rejuvenation being important aspects of the Caribbean tourism product offering, the CTO is encouraging member countries and private sector partners to plan and organise events and activities around the theme that will appeal to consumers, travel agents and tour operators. “For those who focus on renewing body and spirit, the options are virtually endless; from beachfront workouts and yoga retreats, to wellness resorts and spa treatments, the notion of being rejuvenated in the Caribbean is one more reason to let us pamper you in 2018,” the secretary general said. The global wellness sector is a $3.72 trillion industry, according to the Global Wellness Institute, a Miami, Florida-based non-profit-making organisation that provides global research and insight into the wellness industry. The 2018 Caribbean Year of Wellness and Rejuvenation will be promoted through social media and traditional media channels and will create opportunities for travellers and holiday planners to share their experiences and ideas of how to welcome visitors to the region for wellness and rejuvenation. Through the campaign, CTO, its member countries and private sector partners will highlight the Caribbean as the leading choice for wellness and rejuvenation. At the briefing, Mr. Riley also announced that the Canadian market was a strong performer during the first half of 2017, with arrivals up by 6.4 per cent over the corresponding period last year, and is expected to continue to register growth this year despite the hurricanes which impacted about 25 per cent of CTO member countries. “The Conference Board of Canada is predicting that decent capacity and relative value will support growth and expects a transfer of demand from affected destinations to unaffected countries, with the overall impact likely to be minimal,” he said. In addition, the Conference Board of Canada predicts that Caribbean air lift from Canada will be stable, with capacity up by double digits to about a dozen Caribbean countries through to July, while several others showed strong growth of between five per cent and ten per cent. Jean Augustine (right) receives CTO Lifetime Achievement Award from CTO secretary general Hugh Riley (centre) while close friend Rita Cox (left) looks on. 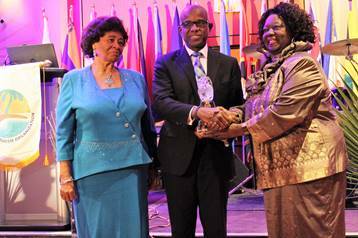 TORONTO, ON, 13 November, 2017 – The Caribbean Tourism Organization (CTO) has bestowed its most prestigious honour on social advocate Jean Augustine. The Grenada-born retired Canadian school teacher and politician was given the CTO Lifetime Achievement Award – the first person ever to be given this award in Canada – at a glitzy Caribbean Ball in Toronto on Friday evening. “For your many years of passionate involvement in civic and diaspora activities, your extensive advocacy for education and social justice, your dedication to the development of the Caribbean and your leadership in investing in our youth by the establishment of the chair in education, community and Diaspora at York University; for these and other outstanding achievements which are symbols of your commitment to our youth, the African Caribbean community and all citizens, we honour you,” the citation said. Ms. Augustine was a trailblazing politician and social activist, having worked her way from a nanny when she first arrived here in 1960, to become the most powerful black woman in the Canadian parliament. She was the first black woman elected to the Canadian parliament and the first black cabinet minister, acting as Prime Minister Jean Chrétien’s trusted voice on committees and at international meetings and in Parliament when he was absent from the house of commons. During her acceptance speech, the Ms. Augustine described how she once persuaded the Canadian prime minister to meet Caribbean leaders in the region instead of having them travel to Canada. That meeting was held in her country of birth, Grenada. She also described her battle to get the government to ease visa restrictions on Caribbean nationals, a battle she said she lost. Prior to serving in parliament, Ms. Augustine was a school teacher and during her career in the teaching service she was an activist in Toronto’s Caribbean communities, volunteering with grassroots organizations to strengthen immigrant and women’s rights and to combat violence against women, drug abuse and poverty. In 1967, she served on the committee that helped organise the first Caribana festival, and in the mid-1990s she played a crucial role in establishing Black History Month in Canada. “The Caribbean Tourism Organization’s Lifetime Achievement Award honours individuals who have made an outstanding contribution to society and who, by their example, have inspired at least one generation. Ms. Augustine’s achievements have far exceeded those criteria,” the CTO said. Ms. Augustine promised to place the award in a fitting location where it can be seen and appreciated by members of the public. The honouree was introduced by her close friend Dr. Rita Cox, who shared compelling stories of Ms. Augustine’s advocacy on behalf of the region and her dedication to teaching. The event was addressed by Ontario’s minister of education Mitzie Hunter, while minister of tourism, culture and sport Eleanor McMahon, who was unable attend, sent a message of welcome in which she described Caribbean Week Canada as “a wonderful way to celebrate our vibrant Caribbean-Canadian culture, which is such an important part of many communities in Ontario”. “I invite everyone to take advantage of the opportunity to network and discover new and exciting ways to strengthen tourism ties between Ontario and the Caribbean. I would like to thank the Caribbean Tourism Organization, its partners and volunteers for their commitment to a sustainable tourism industry that contributes to the well-being of the people of the Caribbean,” she stated. The Caribbean Ball, which was held at the Doubletree Hilton Downtown Toronto, was a fundraiser for the CTO’s hurricane relief fund and the CTO Foundation, the organisation’s scholarship programme which provides scholarships and grants to Caribbean nationals pursuing studies in tourism and hospitality. 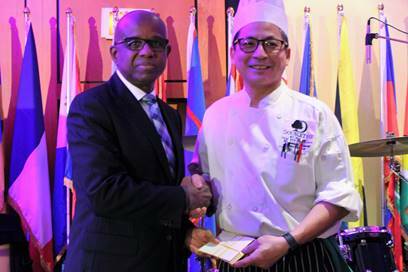 During the event, the hotel’s wait staff presented over $1,000 to the CTO’s secretary general Hugh Riley, monies collected through their own fundraising efforts to help Caribbean countries that had been affected by hurricanes Irma and Maria. Organized by the CTO, Caribbean Week Canada 2017 combines business sessions and consumer-oriented events with Caribbean-inspired food, lively entertainment and networking opportunities. For more information on any of the Caribbean Week Canada events contact the Caribbean Tourism Organization at 905-857-1986 or visit canada.caribbeanweek.com. The Tale of Two Cities by Charles Dickens has been quoted so much over the years that it has become somewhat of a cliché. However, in the present context, it is a most appropriate cliché for our circumstances as the Caribbean has witnessed the proverbial tale of two cities during the past ten months or so. We had the best of times, with record performances in the first half of 2017, and for some of our member countries, and by extension the region, the worst of times with the passage of hurricanes Irma and Maria. We began the year growing at a healthy pace of 5.2 per cent between January and June, when compared to the same period last year. This was ahead of the growth rate of 2.5 per cent to 3.5 per cent which had been our forecast and was a reflection of economic stability in the market, expansion and inauguration of flights by major carriers and new marketing and product development initiatives. During this period the region recorded 16.6 million international tourist arrivals, some 800 thousand more than in the first six months of 2016. Growth was recorded in all major source markets except South America, which contracted by 14.3 per cent. Up to June, the European market had grown by 7.9 per cent, Canada by 6.4 per cent, and despite the weak sterling, the UK grew by 4.8 per cent. In the hotel industry, the half-year outcomes reported by STR Global showed that average occupancy increased marginally by 0.2 percentage points to 70.8 per cent, while the average daily room rate rose slightly by 0.2 per cent, moving from US$220.84 in 2016 to US$221.38 in 2017. Growth in the cruise sector also remained positive and stronger than the expected performance in the first half of the year. At the end of the first six months of 2017, cruise passenger arrivals to the Caribbean region had reached an estimated 15.3 million, up four per cent over the corresponding period of 2016. This performance represented the largest number of cruise passengers in the region at this time of year. Then came the hurricanes – first, Irma, then Maria – that inflicted such damage on some of our member countries, causing such despair! There has been widespread coverage of the damage caused to these countries and territories, the most serious among them being Anguilla, Barbuda, the British Virgin Islands, Dominica, Puerto Rico, both Dutch and French Saint Martin and the US Virgin Islands. Understandably, this triggered a slowdown, with travel to many of these destinations having been severely impacted. Consequently, we have revised our forecast for 2017 to between one and two per cent, with a similar growth rate projected for next year. This is expected to have a significant economic impact, based on predictions by the Caribbean Development Bank; according to the CDB every one per cent reduction in tourist arrivals could cost US$137 million in lost revenue. Our revised forecast is based on a number of factors, including figures provided by CTO’s partner, OAG, the air travel data provider based here in the UK. Data based on schedules that were provided to OAG by the airlines showed that in October the number of flights to the region fell by 6.7 per cent, while seat capacity contracted by 4.1 per cent. Among the worst hit destinations, the frequency of flights to Puerto Rico decreased by 25.1 per cent, Dominica by 13.7 per cent, St. Maarten by 12 per cent, the British Virgin Islands by 11.2 per cent, Anguilla by 6.3 per cent and the US Virgin Islands by 5.6 per cent. Seat capacity to all of these destinations was consequently adversely affected with St. Maarten experiencing a near 50 per cent falloff. Some of these reductions were influenced by Hurricane Harvey, which hit the US mainland, but most were a direct result of Irma and Maria. It must be noted, however, that Cuba’s capacity grew by 10 per cent despite changes to the schedule. The new services from the US are a major influence on this performance. The largest of the carriers based in the region, Caribbean Airlines and LIAT, both registered declines in capacity, with LIAT falling by 21.3 per cent and Caribbean Airlines by 9.5 per cent. However, overall, air capacity in the region grew by five per cent for the first nine months of 2017 when compared to the same period last year. As for post-hurricane tourist arrivals, it is still too early to tell, since the October numbers are not yet in. However, with several of the key cruise destinations, including Puerto Rico, St. Maarten and the US Virgin Islands recovering from the impact of the hurricanes, cruise lines made changes to their itineraries to include alternative regional ports which remained open. These redeployments have benefited countries such as Curacao, which registered a 138.3 per cent rise in cruise passenger arrivals in September, Jamaica (54.1 per cent), the Cayman Islands and Grenada. You would have noticed that we predict growth in tourist arrivals this year, albeit slower than expected, which could still mean new record performance for the Caribbean despite the storms. This is mainly due to the fact that some 75 per cent of the Caribbean was unscathed by the hurricanes and continued to welcome visitors. And, if we are to return to Dickens, there is prodigious strength in sorrow and despair, as a brilliant people rise from this destruction and devastation, with the fighting spirit of the people of the Caribbean, ready to rebuild stronger and more sustainably than before. Already, virtually all of the affected countries are reporting that they are open again for business, although not at full capacity, with every one of them planning some sort of event either later this year or early next year. A separate document will be presented to you outlining the state of readiness of these countries. Thank you all for coming and for helping spread the word that the Caribbean is open for business, and for reminding everyone that the best way to help the Caribbean is to travel to the Caribbean.